Diamonds are polished to an accurate angle and radius. Purpose-designed for modern, high-accuracy form dressing attachments. Diamonds are set using Breton International’s specially-designed matrix powders. 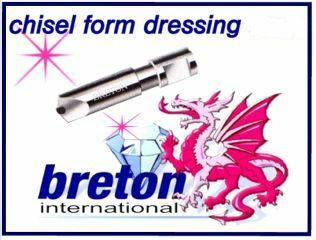 Breton International can manufacture a complete range of Diamond and Polycrystalline Chisels including Diaform,Hoglund,Fortuna,Shaudt,Moore and J&L.We can also manufacture to your own specifications,please contact us for pricing and delivery.